Most of the increase can be explained by significant changes in funding from eight of the top 10 funders; notably, the Norcliffe Foundation increased giving to the state by 105% ($17 million) and The Boeing Company increased contributions to the state by 92% ($13 million). 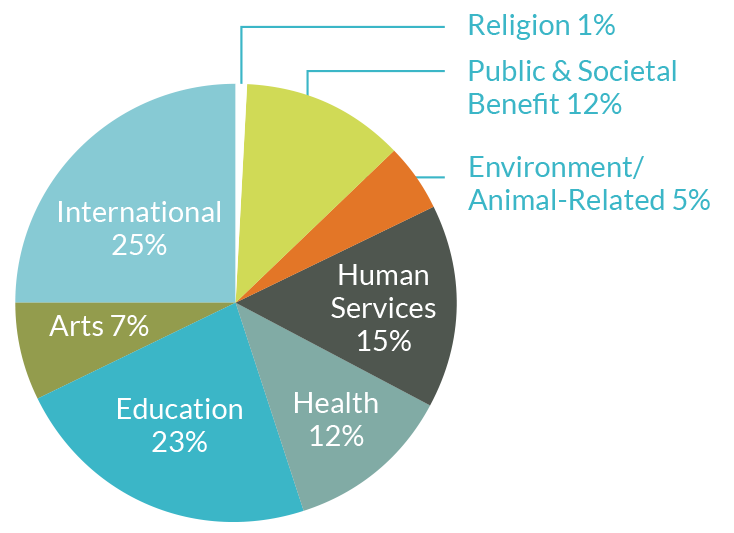 International organizations received the greatest proportion of funds (25%), totaling more than $133 million. Nearly 92% of all international grants were allocated to health-related issues, including communicable disease prevention and vaccine development. Giving to education increased by 52% ($40 million) in 2012. This increase was predominantly driven by significant shifts in giving to: two-year colleges and technical schools, up 87% ($4.4 million); four-year colleges and universities, up 74% ($20.4 million); and early childhood and K-12 education, up 67% ($14.4 million).